Surge in demand for security is just the job for electricians who met at college | News by Wales Express News, People Before Profit! An electrical business set up by two former apprentices who met in college is enjoying a boom thanks to a surge in security work. Electricians Ryan Griffiths and Nick Dacey teamed up last year as RN Electrical and Security after forming a friendship as apprentice electricians at what is now Coleg Cambria’s Bersham Road campus, in Wrexham. And now half the pair’s business is taken up with installing security systems and cameras for businesses and homeowners across a wide area of North East Wales and the border counties. It has seen them expand quickly so they have now taken on an apprentice of their own and are looking for another qualified electrician to help keep pace with their workload. Nick, 28, from Acton, in Wrexham, said: “I don’t know whether people feel more at risk now but security, installing alarms and CCTV, is becoming massive for us, mainly at private homes but also at businesses. They have also been helped by a decision to use a storage container at the Lock Stock Self-Storage Park on Ruabon Road, Wrexham, as a base to operate from and Ryan said: “It has made a big difference to us because we are able to carry more stock. “It also means we can buy more and more cheaply because we’re buying in bulk – we can organise the work the day before and load up first thing next morning and head straight out. Both Ryan and Nick were interested in careers as electricians and did their apprenticeships together in Wrexham and worked with local firms before deciding to go into partnership. Nick said: “We both went to the Bersham Road campus where we met. It’s really good there and they give you an excellent grounding. The pair started by rewiring a big, six-bedroom house in Wrexham and have been in demand throughout and Ryan said: “We organise what we’re going to do the previous day, do quotes at night and then meet up at Lock Stock in the morning. “We’re growing the business and we’ve been busy from the start but we want to continue to grow – we’re not working 60 hours a week to carry on running a couple of vans for 20 years. Nick added: “It is difficult to find qualified electricians and that’s true in all the trades in the building industry, there’s a definite skills shortage. “But I think we’ve gone about the business well. Our overheads are low and we’ve grown by recommendation so people are not just pulling your names off a website. Ryan said: “If you wanted three words to sum us up it would be efficient, reliable and clean. “You have to be organised and turn up when you say you will and not let anyone down. Nick added: “The customer is the most important thing because without them you don’t have a business but you can be as nice and pleasant as you like and as clean as you like but you do have to know what you’re doing. “We are busy and anyone who isn’t is doing it wrong. If you’re willing to work hard and do a good job then people will use you and recommend you. “I think the secret for us was not to go too big too quick because it’s a mistake to get overextended and not to be able to deliver what you promise. Ryan said: “In business you have to admire anyone who has made it from nothing to something and people who see an opportunity. “I admire Lock Stock because they saw an opportunity for self-storage and they have built on that and seen how using a container can benefit a business, or how it can make sense to hire vans from their sites or even sell fireworks. 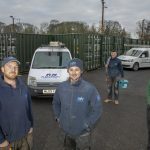 Caption: 20190104- RN Electrical-1: RN Electrical and Security are based at Lock Stock Self-Storage in Ruabon Road, Wrexham, and pictured are business partners Ryan Griffiths, left, and Nick Dacey, right, with Lock Stock site manager Mike Trow and apprentice electrician Will Davies. 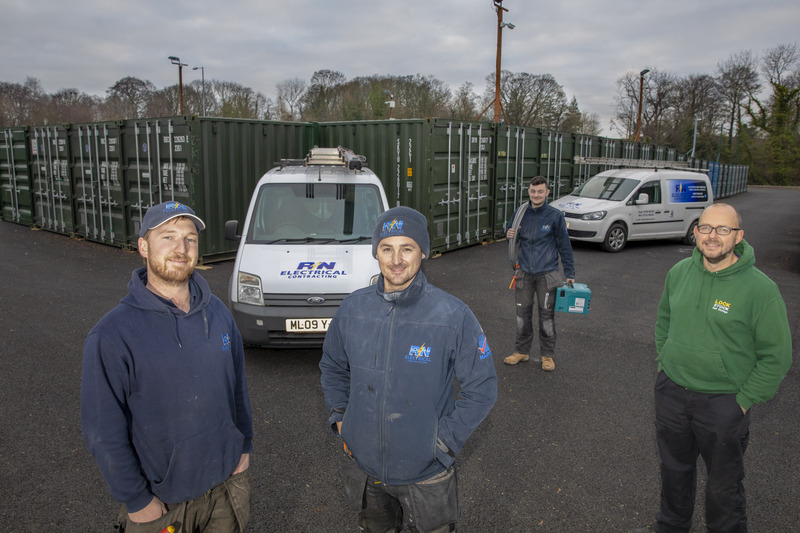 20190104- RN Electrical-8: RN Electrical and Security are based at Lock Stock Self-Storage in Ruabon Road, Wrexham, and pictured, from left, are business partners Ryan Griffiths and Nick Dacey with Lock Stock site manager Mike Trow and apprentice electrician Will Davies.